Colcannon is a greater-than-the-sum-of-its-parts dish, good the first night and even better the second. I’ve long loved potatoes, and in the last year have discovered how much I like cabbage. But potatoes and cabbage together? Oh my. They sing harmony to one another. 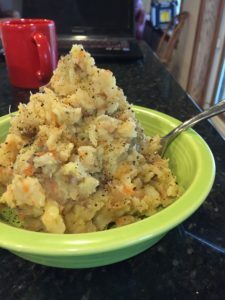 Maybe you already know colcannon – a traditional Irish dish of seasoned mashed potatoes and cabbage or kale, sometimes with meat but not always – but for me this was a new discovery. I’ll be making up for lost time now. 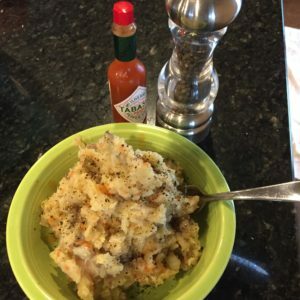 The vegan, no-oil colcannon recipe that has me swooning – my honey, too – is from Vicki Brett-Gach’s Ann Arbor Vegan Kitchen blog. She uses a bag of shredded cabbage, I shredded the cabbage I had at home. She calls for creole seasoning, we didn’t have any so I Googled what’s in creole and made my own. Creole is similar to Cajun, if you have that. She calls for Dijon mustard, I used brown. I think we may have doubled the mustard. Point being, don’t get hung up on the details. Essentially, you boil potatoes and cabbage together much like you’re making mashed potatoes. Meanwhile you saute sliced onions. Then you drain the potato water, mash the spuds and cabbage, toss with seasonings and pepper. Then you pile your colcannon high in a bowl. You take little spoonfuls so the gustatory pleasure lasts a long time. Hot, soft, slightly tangy, rib-sticking, holy food gods good. You don’t eat more because you’re full. You reheat the second night (about an hour in a 350 degree oven) and it’s even better. This is just too tasty to have just once a year.